Night Poem (tribute to Lêdo Ivo, 2014) Gonzalo Ivo. Photo: Disclosure. Gustavo Rebello Arte the exhibition presents to the public Aurora, the painter and artist carioca Goncalo Ivo, from 25 of May to 24 June 2016. The show brings together part of the 35 paintings that illustrate the brazilian Edition of the book Aurora, the father of the artist, the writer and poet Lêdo Ivo alagoano (1924-2012), published posthumously in Spain, in 2013, and that will be launched with the opening of the exhibition, in 24 de Mayo, at 18h. "It's time to leave/leave without taking anything in order of the dawn, on aurora amanhecida ", are the verses that contain the book Aurora, of Ledo Ivo, with reproductions of paintings by Goncalo Ivo made especially for the brazilian Edition of the book, According to the wishful thinking of the poet alagoano, late in December 2012. These paintings not only condense and move the recent pictorial research of Goncalo Ivo, How to serve to illuminate the 15 works present in shows, between which two paintings in the format 220 x 140 cm, made about formica, unprecedented support in production and first presented to the public. Aurora 2015-6 Gonzalo Ivo. Photo: Disclosure. 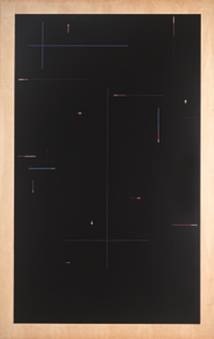 In one of them, Night poem, tribute to Lêdo Ivo, from 2014, painted over black formica, crosses and lines, applicants in their latest works, establish a mysterious constellation, whose colors, motion pregnant, carry with them the clarity that, in the words of his father on the aurora, “[…] allows you to view/matter in the world ". As the verses, This time, Open the ultimate book prepared by Lêdo Ivo, "At the crack of dawn/everything's Epiphany", and the painting of Gonçalo, as if the set now exposed, continues to celebrate, in his own religiosity, appearance, “[…] coming of the shadow/the mystery of the night ", return to look at the ability to amaze and revive themselves with earthly things. Under Gustavo Rebello Arte's initiative and with the support of the back cover Editor, the exhibition, Aurora, conjugates, and, two lines of force of the trajectory of Goncalo Ivo: the incessant chromatic research, daily invoked in his Studio, and the dialogue with other manifestations of art and spirit, often established in the form of books. "The painting of Goncalo Ivo is more than a color study, is a school for the color. There, she learns. Matures, how effectively hunted animal, You can't help but take your evidence in the world. Each screen is a class, made of superior mastery, where the light falls to worship no longer while chance, But while intelligence. This is the difference between the color by consciousness and casual. The work of Gonçalo Ivo, Scientist of this art, It's a way of revelation, While not delusional attempt but exactly as pronunciation of Sage that comes closer to what you couldn't see. " Valter Hugo Mãe. Goncalo Ivo (Rio de Janeiro, 1958) is a painter, Illustrator and Brazilian teacher. 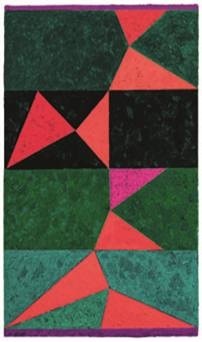 Son of the writer Lêdo Ivo (1924-2012), He studied painting at the Museum of modern art of Rio de Janeiro, in 1975, Aluisio Coal-oriented and Sergio Campos Melo. Graduated in architecture from the Fluminense Federal University, He was a professor in the Department of educational activities of MAM/RJ, between 1984 and 1986. He taught as a visitor at the school of fine arts of the Federal University of Rio de Janeiro – EBA/UFRJ, also in 1986. He worked as an Illustrator and visual programmer for Global publishers, Record and Pine Press. Do individual and collective exhibitions in Brazil and abroad. In 2000, signed the program scenario Metropolis TV Cultura. That same year, He set up a workshop in Paris. Opening for guests and book launch Aurora, of Ledo Ivo: 24 May 2016, at 18h. Period: From 25 of May to 24 June 2016. From Monday to Friday, das 12h às 20h.